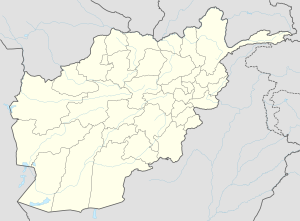 Spin Boldak (English: White desert) is a border town and the headquarters of Spin Boldak District in the southern Kandahar province of Afghanistan, next to the Durand Line border with Pakistan. It is linked by a highway with the city of Kandahar to the north, and with Chaman and Quetta in Pakistan to the south. Spin Boldak has the second major port of entry between Afghanistan and Pakistan, the Wesh-Chaman border crossing. It is also a major transporting, shipping and receiving site between the two neighboring countries. The district is populated mostly by Noorzai and Achakzai Pashtuns. Other names: Spīn Baldak, سپین بولدک, Spīn Būldak, Spīn Bōldak, Spin Baldak. Kandahar and Quetta are about 40 and 50 nmi (93 km) respectively distant by air, and have the closest medium-sized airports; Pishin, Pakistan has a small airport 40 nmi (74 km) to the east. With an influence from the local steppe climate, Spin Boldak features a hot semi-arid climate (Köppen BSh), characterised by little precipitation throughout the year. The average temperature in Spin Boldak is 19.7 °C, while the annual precipitation averages 217 mm. July is the hottest month of the year with an average temperature of 31.8 °C. The coldest month January has an average temperature of 6.9 °C. In January, 2006, "a suicide bomber on a motorbike killed at least 20 people and wounded 20 more," according to one report. "The attacker drove the vehicle into a crowd watching a wrestling match and detonated a bomb, said Kandahar provincial Gov. Asadullah Khalid." The Taliban claimed responsibility for the attack. The town was the site of a suicide bombing in February 2008 that killed 38 Afghans and injured several Canadian soldiers. In April 2010, three nephews of the former governor of Spin Boldak district, Hajji (or Haji) Fazluddin Agha, aged 15, 13 and 12, were killed in a bomb attack. The bomb was attached to a donkey which was led to the checkpoint in front of the former governor's home and detonated by remote control. Hajji Fazluddin Agha, according to the report, is of one of President Hamid Karzai’s most important political allies in Kandahar, and had also served as Mr. Karzai’s top campaign official in Kandahar Province. He was unhurt in the bombing, but two bystanders and two policemen were wounded. In 1891 the British extended the Indian Railways system (now Pakistan Railways) to the border town of Chaman via the Khojak Tunnel from Qilla Abdullah, from the east and thence south. The rails were not extended into Afghanistan to the north and west for political reasons. Spin Boldak, Afghanistan, is less than 10 km from Chaman, Pakistan. Over much of the last century, there have been proposals to extend the Chaman line to Afghanistan and possibly beyond, passing through Spin Boldak. These proposals have the support of the current Afghan government. In July 2010, Pakistan and Afghanistan signed a Memorandum of understanding for going ahead with the laying of rail tracks between the two countries. Work on the proposed project is set to start in the next four months. ^ "The Master of Spin Boldak: Undercover with Afghanistan’s drug-trafficking border police" by Matthieu Aikins, Harper's Magazine, December, 2009, p. 54. Retrieved 2010-04-20. ^ Falling Rain Map of Spin Buldak. Retrieved 2010-04-20. ^ "Climate: Spin Boldak - Climate-Data.org". Retrieved 9 September 2016. ^ "Taliban attacks kill at least 24 in Afghanistan", CBC News, January 16, 2006, 12:32 PM ET. Retrieved via Yahoo! Image 2010-04-20. ^ "Canadian troops blamed in blast that killed 38" by Stephanie Levitz, The Canadian Press, and Noor Khan thestar.com, February 18, 2008. Note: The Canadians were blamed by Asadullah Khalid only to the extent they ignored his warnings of the risk. Retrieved 2010-04-20. ^ "Explosives cache found in Kandahar as escalation of Taliban attacks feared" by Ethan Brown, Canwest News Service, May 2, 2010. Retrieved 2010-07-12. ^ "Deputy Mayor of Kandahar Is Killed" by Richard A. Oppel Jr. and Taimoor Shah; T. Shah reported from Kandahar; an employee of The Times contributed reporting from Khost, as did Sangar Rahimi from Kabul; Oppel reported and filed the story from Kabul; The New York Times, April 20, 2010. Deputy Mayor Azizullah Yarmal of Kandahar city was killed the same day in a separate incident. (A version of this article appeared in print on April 21, 2010, on page A6 of the New York edition. "A Killing Further Erodes Afghan Faith in Leaders.") Retrieved 2010-04-20, 2010-07-12. A Canadian convoy passes a "jingle truck" on its way to Forward Operating Base (FOB) Spin Boldak ..., flickr photo AR2006-G014-0046 23 September 2006; uploaded on October 2, 2006 by lafrancevi. Note upgraded 2010-04-20. Amazing Rocks Near Spin Boldak, flickr photo uploaded on June 6, 2009 by ♥♥ AchakzaiElite ... ♥♥. Retrieved 2010-04-20. This page is based on the Wikipedia article Spin Boldak; it is used under the Creative Commons Attribution-ShareAlike 3.0 Unported License (CC-BY-SA). You may redistribute it, verbatim or modified, providing that you comply with the terms of the CC-BY-SA.